As reported in Canadian Underwriter, the Government of Saskatchewan recently announced steps to improve pipeline regulations after the completion of its investigation into last July’s Husky Energy pipeline oil spill. Husky Energy was responsible for an oil spill of 250,000 litres into North Saskatchewan River. Crews discovered the oil leak from a pipeline on July 20th after pressure anomalies were remoted measured in the pipeline. A crew investigated the pressure anomalies and discovered the leak. The spill caused communities downstream, including Battleford and Prince Albert to declare states emergency, and stop taking their drinking water from the river. A Saskatchewan government investigation into the incident recently released its findings. The government report concluded that the cause of the spill was mechanical cracking in a buckle in the pipeline. The mechanical cracking was the result of many years of ground movement on the slope that the buckle rested. 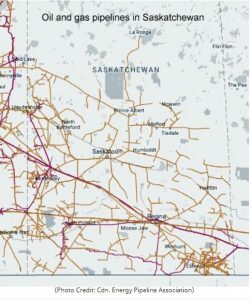 One step the Saskatchewan government is taking to prevent future oil pipeline incidents is the introduction of a Bill (Pipelines Amendment Act) aimed at enhancing regulatory oversight of pipelines in the Province. If passed, the Bill will address the current gaps in the provinces existing legal framework and provide the foundation for strengthening regulatory requirements for pipelines. The provincial government is reviewing the legacy designs of oil pipeline crossings over water to determine whether additional measures are needed to manage geotechnical risks. One of the findings from the review of the Husky Energy incident was that the pipeline was built in 1997 based on the engineering standards of the time.